I came across this interesting ‘comment is free’ article by Jeb Lund in the Guardian last week which is worth taking a look at. He discusses how the majority conservative school board of Jefferson County, Colorado want to make changes to the Advanced Placement American History Curriculum taught in schools in order to ensure that the history taught in the classroom “promote[s] citizenship, patriotism, essentials and benefits of the free market system, respect for authority and respect for individual rights”. To achieve this they have drafted a curricula proposal that will ensure that lessons only present American history in a positive light – any negative aspects will be omitted. Students, teachers and parents are protesting – see here and here. This is a great example of how history is used in an educational context for political, ontological and ideological purposes as well as to encourage compliant citizens – a topic I am very interested in. 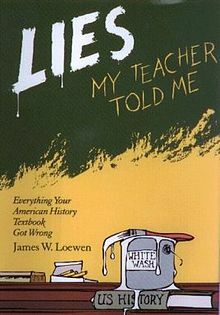 Incidentally James W. Loewen has an excellent book on this subject called Lies my Teacher Told Me: Everything Your American History Textbook got Wrong (New York: Simon and Schuster, 1995) – I recommend reading it. We could ask whether it is wrong for school history lessons to be so partisan and political? We could ask whether it is wrong that history as taught in schools essentially has political and economic functions – it is intended to promote citizenship, patriotism and the free market – rather than simply conveying the truth about the past. But I would ask is it ever possible for history to be taught in a neutral, non-political way? Would we really want that? Well I am not so sure about that. For me history is a literary genre, a way of writing about events, the ‘before now’, the past. As such it offers a perspective on events, an interpretation. While of course we can make judgements about historical texts – we can check to see if they adhere to the (contingent and temporary) protocols of the history profession and we can comment on their aesthetic, literary and political aspects – we can’t distinguish between politicised accounts of past events and those that simply record what happened. All histories are politically motivated. Yes, some histories flout the conventions of history writing by deliberately ignoring commonly agreed upon ‘facts’ or ‘evidence’, and some employ interpretative strategies that many would find inappropriate – we consider these to be bad histories or not history at all. However, all histories to some extent either implicitly or explicitly have a political agenda – it is just that this only becomes obvious when it conflicts with our own perspective and political preferences. What we agree with is impartial, what we disagree with is partial.